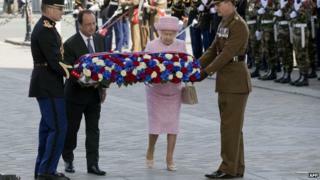 The Queen has laid a wreath at the Tomb of the Unknown Soldier in Paris at the start of her state visit to France. She joined France's President Francois Hollande in honouring the war dead at the national monument. Her three-day trip also takes in the D-Day anniversary and together with the Duke of Edinburgh she will travel to Normandy for the 70th anniversary of the landings on Friday. The event takes place at the site of the invasion by Allied forces in 1944. The Queen will also have a flower market in Paris renamed after her during the visit. The monarch and the Duke were greeted by Britain's ambassador to France, Sir Peter Ricketts, as they arrived at Gare du Nord station in the French capital on a Eurostar train. Sometimes the passage of years makes it easier to say those things that are most heartfelt. Queen Elizabeth II is greatly respected in France. She is a hereditary monarch visiting a country which, though it dispensed with its kings and queens several centuries ago, still enjoys the pomp and grandeur which is such an indispensable part of monarchy. She also represents those qualities of dignity and devotion to duty which the French rather admire and which, perhaps, they wish were more evident in the upper echelons of their own establishment. But most importantly in the context of this week's 70th anniversary of D-Day, Elizabeth II is from that wartime generation, so many members of which made the ultimate sacrifice in order to rescue the French nation from subjugation by the Nazis. The Second World War hasn't always been an easy subject for France to deal with. Yet deep in its heart it's always known the debt that it owes to the people of the United Kingdom and its allies for the liberation from tyranny which began when the landing craft went ashore in Normandy on 6 June 1944. In inviting Elizabeth II to attend the D-Day commemoration as part of a State Visit, France has made her the most honoured of all the heads of state who will be in Normandy on Friday. Partly that is a personal tribute to her and the 62 years of her reign. But one senses that it is also France's way of expressing its most heartfelt gratitude to the entire British D-Day generation. As the royal couple travelled along the Champs Elysees in a limousine their route was lined by 146 mounted members of the Republican Guard. At the Tomb of the Unknown Soldier, beneath the Arc de Triomphe in Paris, both the Queen and Mr Hollande laid their hands on a large wreath of red, white and blue - the national colours of France - as it was lowered to the tomb's base by a senior British officer and his French counterpart. The Queen and president then bowed their heads in a mark of respect. During her visit, the monarch will also attend a market which will be now known as Marche aux Fleurs - Reine Elizabeth II in tribute to her as a special honour from the people of the French capital. Her Majesty will be joined by the Prince of Wales and Duchess of Cornwall, and the Duke and Duchess of Cambridge. Later, at the ambassador's residence in Paris, British food and drink was served to guests including World War Two veterans from France and the UK. The garden party, held to mark the Queen's birthday, saw her shake hands with guests including Olympic gold medal and Tour de France winner Sir Bradley Wiggins. On Friday, the Queen and Prince Philip will meet veterans and mark the sacrifices of those who liberated the continent from Nazi Germany. And a state banquet in the Queen's honour will be held at Elysee Palace on Friday evening.